What I Never Understood. Truth, Lies & Inconsistencies. I was originally going to post this in the Naruto Discussion Thread but I didn’t want it to just get lost in there. Apologies in advance if this doesn’t warrant a new thread but we worked quite a while to compose it. We compiled this thread in order to come to a conclusion as to why certain things were done. Old news or new news, it’s something that’s always been bewildering. Please do not read/debate this with any form of bias. We are dedicated Naruto fans, but REAL fans take the time to point out and discuss flaws and inconsistencies (Unlike 95% of youtube). Originally after 615, I thought that the manga’s fate was sealed with NH happening (Well as far as holding hands and passing chakra goes). But here’s the thing, nothing progressed with that afterwards. In fact, it was the complete opposite phenomenon. Throughout the next 30-40 chapters or so, Kishimoto composed panel upon panel of similar events which we put together. Why include this parallel? Why have Naruto confirm he still loves Sakura? Why have Minato compare Sakura to Kushina? (which brings us back to Kushinas words: “Find a girl like me”). If this is not the “desired” outcome, then why include it? Now we put together more various moments/panels. Thesis 2: Okay, we see Sakura showing concern about Naruto’s excessive use of chakra in protecting the Allied Shinobi Force. It can be done once to get that point across. But why the need to add PANEL upon PANEL emphasizing her worries and facial expressions. Take a good look at the care and detail he’s portraying. I mean it’s unnecessary at this point right? (that’s the initial thought). Moving on, we have another composition. Thesis 3: Ok so Naruto had his tailed beast extracted and Sakura is trying to keep him alive. Again we could have just skipped towards the part where Naruto is taken by Gaara to Minato/the point where Obito inserts the missing part of the biju inside him. But again we don’t. 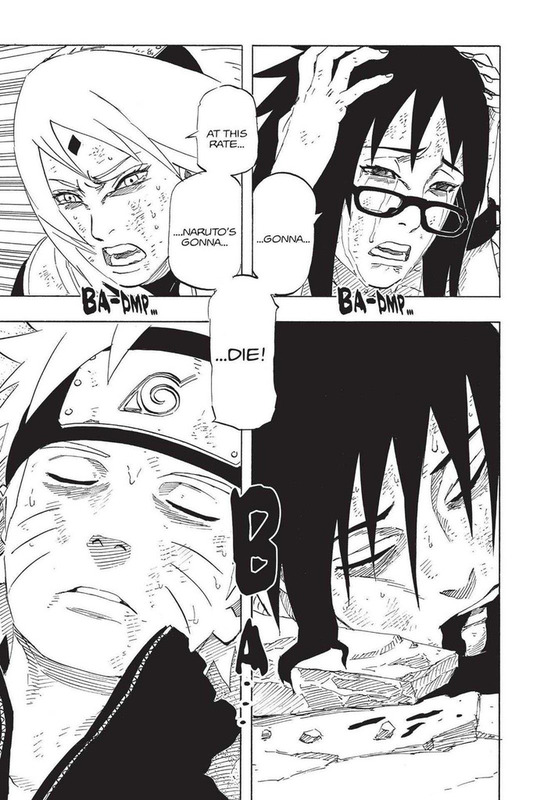 Instead Kishimoto takes the time to make all these PANELS, with Sakura worrying to death about Naruto. Again take a look at the facial expressions and thoughts. She thinks about his dreams, his goals and fears of him disappearing. Isn’t it a little overboard? 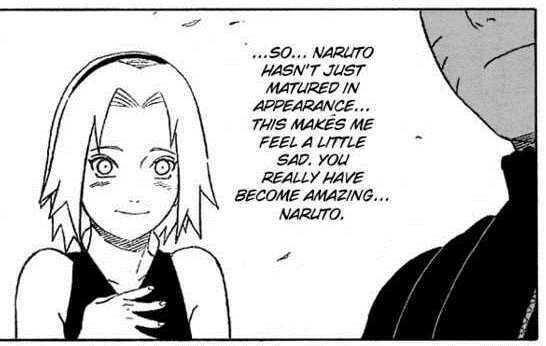 Again if Kishimoto has another ending in mind why spend time on ALL these panels, details and emphasizing these thoughts and memories from Sakura’s viewpoint? 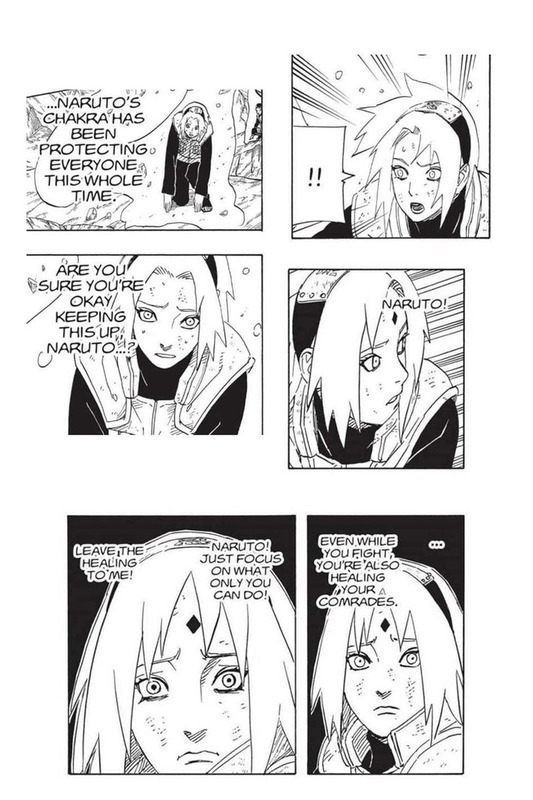 Thesis 4: Then we also have this entire page/panel dedicated to Naruto and Sakura, and Sasuke and Karin. Again you’ll say that Sakura is Naruto’s “designated healer” and Karin is Sasuke’s “designated healer”. Ok I get that but again. WHY THE NEED TO DEDICATE AN ENTIRE PAGE/PANEL? Usually an entire page is taken when an author wants to put greater emphasis on something happening. Again you’ll say: “Well yea Naruto and Sasuke are dying, he’s emphasizing that”. BUT AGAIN. Why the need to place Sakura and Karin crying so desperately for each. Take a look at the precise care, details and emotions he’s undertaking here. There must be a reason; you don’t just make such decisions haphazardly. 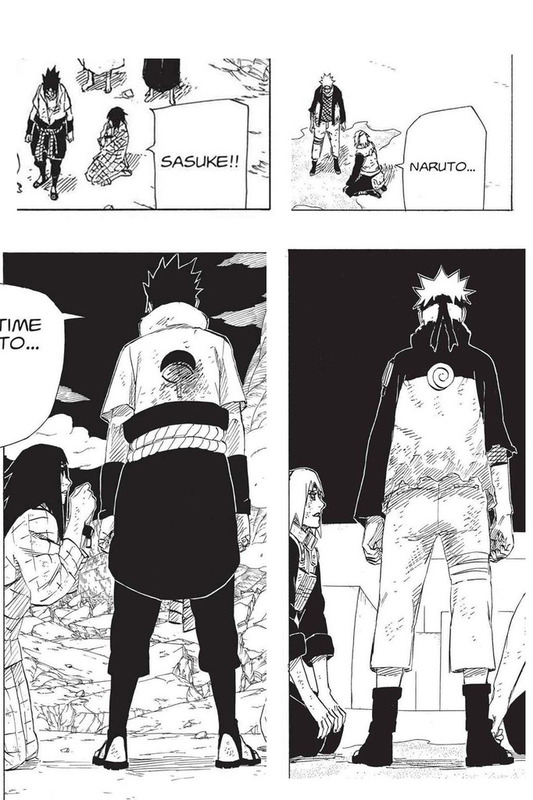 Thesis 5: And finally we have this final parallel (we put the two side by side) when Naruto and Sasuke are “resurrected”. Okay you’ll say that they’re up and ready to go fight. But again, Kishimoto is dedicating ENTIRE PANELS showcasing the same parallel. Karin by Sasuke’s side, Sakura by Naruto’s side. Again if you’re focused on finishing the manga with a different outcome, then WHY litter the manga with multiple panels and parallels of such events. There’s a point trying to be made, and it’s consistent. So now we come to the final question: Why would Kishimoto do this if the goal is NH & SS? Why not have Hinata by Naruto’s side? Why isn’t Sakura running to Sasuke’s side? Don’t give me the excuse that they're in different areas. There’s always a way to do something if you REALLY want to. But again Kishimoto doesn’t do it. In fact, she doesn’t even once, question about Sasuke’s well-being. She only cares about what’s happened with Naruto. Shocking isn’t it? Now here’s the thing: After all this development and dedication towards each panel’s art and story, everything does a complete snap in 693. Sakura cries her eyes out, begs Sasuke to stay and that she loves him till he knocks her out and quotes how he has no reason to love her nor does she. Again, how does this come out of nowhere. It completely reduced her character back to her 13-year-old self when Sasuke was leaving the village with the Sound Ninja 5. There was no other similar interaction even when Sasuke entered the battlefield during the 4th War arc. So WHY the sudden outburst, tears and begging? And poor Naruto just standing there watching and listening. So here’s the conclusion WE came to: Somewhere along the line, whether it was the studio/editors/crazy fan base or a combination of all, the decision was made that the end pairing would be Naruto Hinata, and Sasuke Sakura to make the most money off the Burrito series. Hinata’s popularity was rising (primarily in the West) while Sakura was gathering way too much hate, so Kishimoto went by that regardless of his personal preference fearing backlash. Back on topic: If so, then WHY didn’t Kishimoto spend the chapters of the War arc to flesh and establish these relationships (NH & SS) with interactions, development and whatnot. The answer is simple. Because that was NOT his original plan. Look at the way Kishimoto draws each other's looks and how he writes their dialogues (the blushing, gestures, etc). Then we have these other panels. 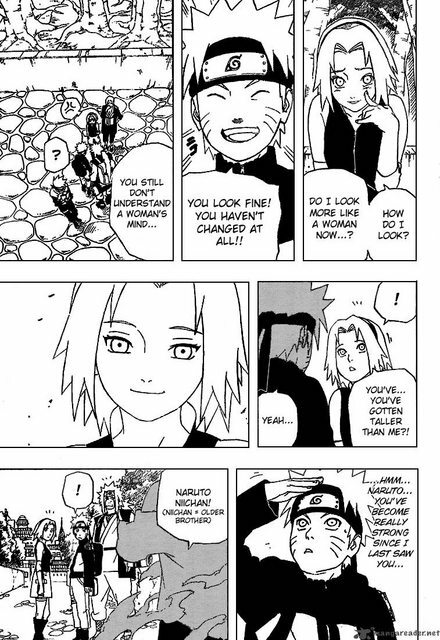 The first confirms that Sakura did indeed find Naruto attractive in appearance. And then the second panel, where Yamato quotes: " It's how strongly you feel that counts". 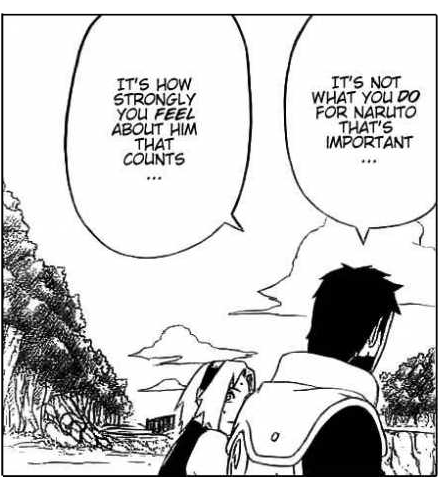 Back to the topic: So ultimately, what made him steer away from this path he builds right when Shippuden starts? Kishimoto KNEW that the ending was inevitable, and he couldn’t get out of it (for whatever reason). But what he could do is write what he wanted AS he wanted when he made his outlines for the arc. 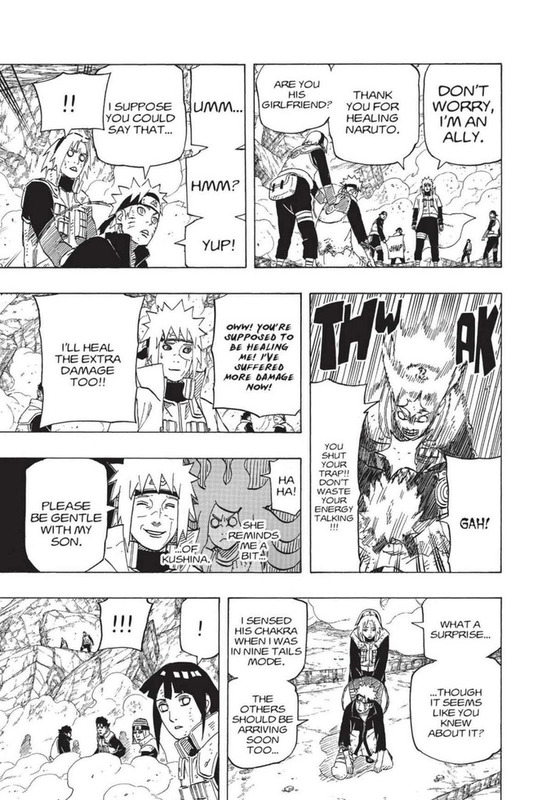 The panels showcasing Sakura’s/Karin's facial expressions, thoughts, and feelings about Naruto/Sasuke were not just mere coincidence. Otherwise it seems like a waste of time. He could’ve spent the time, energy and panel space to add NH moments or SS moments. As we say, it’s a NaruSaku story, with a NaruHina ending. Same with Sasuke and Karin. I can't wrap my mind on any other reasoning. There's WAY too much art, development, and emotions being built throughout the manga. These things take time to draw, devise and finalize by the author. You can't just throw them out like garbage. Last words: Naruto’s downfall & curse will always be its popularity and toxic fan base. Most of the fans who grew up with kid Naruto 15-18 years ago gave up on the manga long ago. They knew what Naruto stood for, the meaning, the symbolism, etc. Today’s Naruto fan base is composed of kids who care only if Naruto can beat Goku, blow up a planet and big melons (yes the fruit). Nevertheless, what is your explanation/answer to all this. Do you agree/disagree and why/why not, etc. Where do I start? Oh well, I originally encountered Naruto when it began airing on Cartoon Network back in 2005 (Today’s CN is a spawn from Hell). Manga wasn’t easily accessible back then as it is today. As for NaruSaku: I originally fell in love with this pairing when Naruto first complimented Sakura’s forehead and wanted to kiss it. Which was the one feature she was always self-conscious about. I just wish she could’ve known it was Naruto after so many years. That and their continued development, chemistry and interactions throughout the manga only solidified my attachment to them! Back on topic: The series was unique and loveable, and after the Zabuza Arc I was hooked. I loved the English Dub personally, each voice matched each character perfectly! Fast forward to the present day and I’m one sad cookie. How did something so precious and full of potential get so bad? Like horrifyingly bad? It’s 2017 and the ending has still broken me. And probably always will. It’s not just about the pairings. The whole last arc was a mess. Don’t get me wrong. Part 1 was a masterpiece and Part 2 I’ll always remember fondly up to the Pain Arc. Everything after just feels like really, really, bad fanfiction. Which is fitting b/c I heard that Yahagi, Kishi’s main editor who helped shape much of the story, left after Sasuke got his MS while still leaving instructions for the Pain arc. How fitting. He probably knew where it was all heading. The power level originally felt perfect for the series. I loved the close, hand-to-hand melee fights, with the occasional hand sign and jutsu/summoning thrown in. I loved when Naruto trained days to master Rasengan, change in Chakra Nature, Nature Energy and Sage Mode. When did we go from that to flying, glowy, super saiyan effects and Michael Bay movie explosions? I’m rambling. Back on topic again: It’s 2017 now. It used to be the 5 of us who met back in school and became best friends, always talking about Naruto and how the story was going to go. We were all NaruSaku fans from the start. It’s so rare and I really treasure that about our friendship. We began to lose interest with each chapter of the 4th Ninja Trash Arc. The only thing we remember fondly are those lovely NaruSaku moments and Madara Shippuden. For us, the moment Kaguya arrived we felt that Naruto as we knew it was dead. It was just barely hanging on but that was the last nail in the coffin. The dialogue was bad. The fight was bad. Naruto cried for Obito and called him the COOLEST guy. Sakura reverted back to her 13- year old Sasuke-kun fangirl self. Sasuke wanted to kill the Kages and Naruto. He put Sakura in a horrible genjutsu. In return he gets a high five and hall pass back at the village. And I think I’ve seen enough laser fox and Megazord Samurais for one lifetime. Ugh. Sakura gushes at Sasuke for poking her forehead. Naruto marries overrated stalker whom he loves now apparently because of a scarf and genjutsu cave and supposedly liked Sakura only because of rivalry with Sasuke. What a load of rubbish. And to think people eat that up. In return Sakura becomes a single housewife with a rogue ninja who tried to kill her twice, and couldn’t care less about her. And we never get to see Naruto actually become Hokage in the manga. Like, really? Last few words: Two of our friends ultimately gave up on the series and don’t talk about it. They’ve become distant. As for the last 3 of us, we’re still together. We think fondly of the memories we built on this series and what it could’ve been. And still can’t stand the atrocity it became and still continues to be with that Burrito manga. Ranting helps vent our frustrations. Sorry if we sound angry. Well darn it. I did take too long and ramble =/ Thank you if you’ve read this far. We really appreciate it. I’m glad to finally sign up and meet all of you. My friends and I love your continued passion for the series and true pairing.